Are you looking for the best router table to use for all of your smaller woodworking pieces? There are a lot of great advantages to using a router table when you are working with smaller, thinner pieces and really it’s the only way to go if you want to get the job done right. Trying to use a handheld router can cause it to jump and mess up your material and it can be very frustrating and time consuming trying to line everything up the right way. Using a table will allow you to make use of a fence which gives you the ability to run your pieces quickly and easily across the router ensuring that you get the results you are looking for. Before we jump into the router table reviews that we’ve put together for you, it is important to know what to look for in the table you are buying. The best router tables will provide you with all of these great benefits and more but at a bare minimum these are the types of features you are looking for. Now let’s take a look at 8 of the best we’ve found so you can find the best router table for the money to use for your next woodworking project. 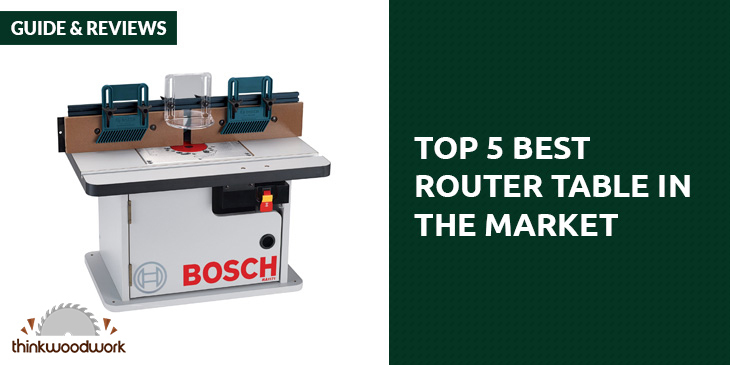 The Bosch RA1181 is the best table router for several different reasons. First off, its compact size makes it ideal for the home woodworking hobbyist who may not have a lot of space in their shop, so if you are limited on space then you will love the compact design. The compact design also makes it portable so it will be easy to take this benchtop router table back and forth to any jobsite you are working on. The RA1181 is compatible with almost every router on the market so you will never have to worry about making any modifications to use your router with this table, and you will be able to quickly get setup and start working on your project. This Bosch benchtop router table while small in size gives you a large work surface that measures 27 X 14.5-inches (W X L) and 18-inches deep. The large precision machined aluminum table gives you a smooth work surface so that your stock will glide across the router bit with ease. If the stock you are working with is a little larger then you will really appreciate the 4 7/8-inch X 25 1/8-inch (H X L) aluminum fence with adjustable MDF face plates that provide better support and smoother operation. You will also get a great dust collection system that features a 2.5-inch port that is compatible with dust collection systems or a shop vac, a heavy-duty dual outlet switch with overload protection, lockout key, and a 6-foot power cord, and a starter pin and guard that allows you to work with curved work pieces. The Bosch RA1181 benchtop router table has everything you need for all of your routing projects and Bosch will even let you take it for a 30-day test drive with a money back guarantee and a 1-year limited warranty along with a 1-year service plan gives you the peace of mind you need to know you will be completely satisfied with the router table you are buying. Are you looking for something that offers a little more? The Award Winning Bench Dog 40-001 Contractor Benchtop Router Table will allow you to make all the dados and rabbets you need on a consistent basis for the projects you are doing. Let’s start off by talking about the sturdy cabinet that is made of 12-layer Baltic plywood and offers 15-inches of inside space to easily accommodate almost any router you are using. The router plate also has predrilled holes that will accommodate most popular brands, and the easy to follow instructions will tell you exactly which holes to use to help save you time when mounting your router. 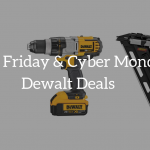 It also offers great flexibility for fine tuning by allowing you to adjust the fence, face boards, dust collection, and miter gauge so you’ll be able to easily set up your job exactly the way you want. 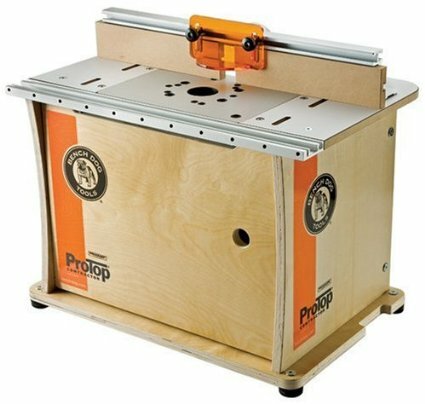 The Bench Dog ProTop offers one of the best router table top you will find with a large 16 X 24-inch workspace, and the non-marring laminate top is strong and durable while being smooth and level enough for you to run a variety of stock across its surface. You will really like the dual fence slots that allow the fence to flip around for larger panels so you will have no problem putting work pieces of all sizes on the table and get an accurate cut every time. The dust collection system features a 2.5-inch dust port that can be used with standard hoses or a shop vacuum to keep your workspace sawdust-free and keep the inside of the cabinet clean. Whether you are a woodworking professional or you are a series hobbyist, the Bench Dog ProTop Contractor Benchtop Router Table packs a powerful punch in a compact size that makes it both light and portable. You get everything you would expect from an Award Winning router table all backed by a Limited 2-year warranty so you’re protected against any parts or labor defects. 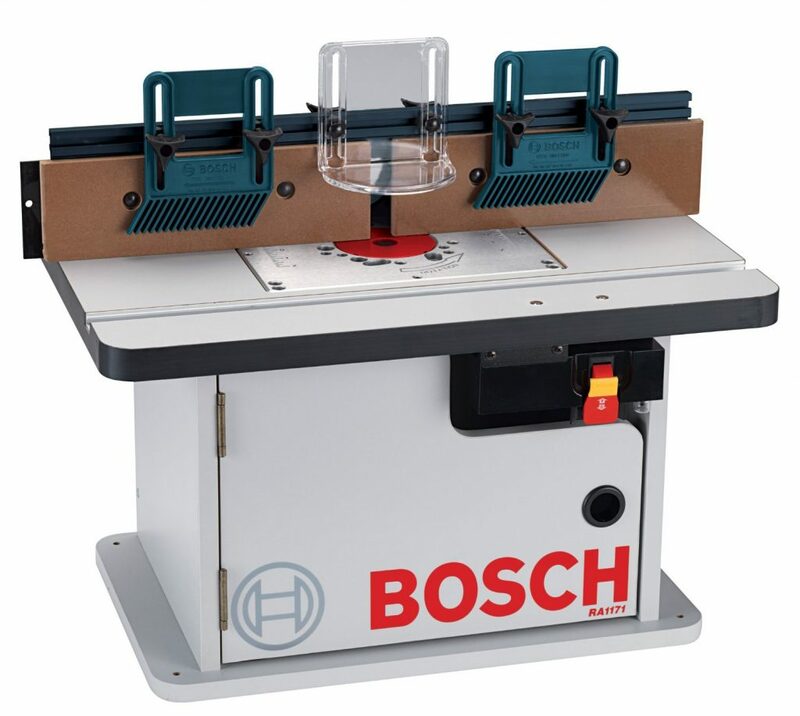 We just had to include the Bosch RA1171 in our best router table review because it offers something for everyone from the part time woodworker to the professional. You might notice that the RA1171 has many of the same features as the RA1181 but there are some noticeable differences that set it apart and give you variety depending on your preferences. 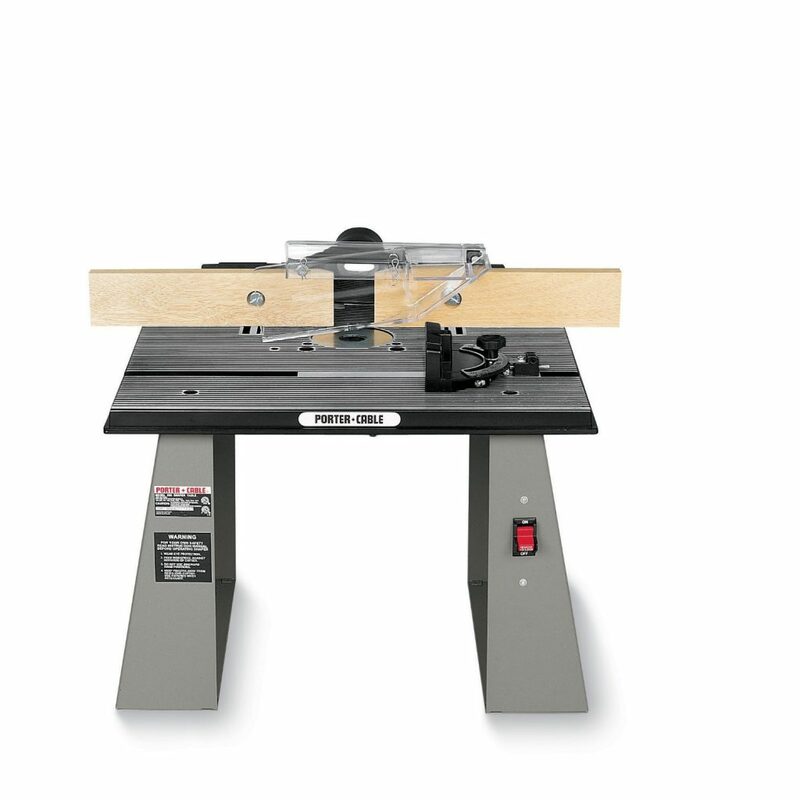 The RA1171 cabinet router table has the same solid sturdy aluminum fence as the RA1181 so you will be able to work with larger pieces with ease, and you will also find a durable aluminum router plate that is predrilled to fit a variety of popular routers. What really sets the Bosch cabinet router table apart is the built-in cabinet that has plenty of clearance to accommodate almost any router you want to use. It also has dual dust collection ports that are 2.5-inches and work with all standard hoses or shop vacuums. The cabinet features a very sturdy construction that will help keep the table stable while reducing noise and keeping your work environment free of dust and debris which also makes cleaning up a breeze. You get the same satisfaction guarantee warranty that Bosch is infamous for giving you 30 days to take this router table for a test drive along with a 1-year limited manufacture warranty and 1-year maintenance contract. The Skil RAS900 Router Table is one of the best router tables because it offers the best in durability and portability. Let’s start by talking about the 2 storage containers that are large enough to store all of the accessories you use while providing additional support to keep the table sturdy for seamless use. If you are someone who has a smaller sized shop in your garage or basement then you are going to love how easy it is to fold the ﻿﻿R﻿﻿AS900 and store it when you are not using it. The legs conveniently fold to the inside toward the table to allow for flat easy storage and easy transport. The MDF laminated table top is very level and the tall fence with adjustable MDF faces allows you to smoothly guide your stock across the table for accurate routing every time. If you hate difficult instructions that make it hard and time consuming to assemble your equipment, then you are going to love the Skil RAS900 because it comes preassembled and ready to go out of the box. That means you will be able to get started on your project right away and get the job done fast. You get everything you need for most projects so you don’t have to worry about buying additional tools and equipment to get the most out of this router table. The RAS900 comes with a guard, featherboard, miter gauge, and bit inserts and the storage containers will ensure you never lose them. 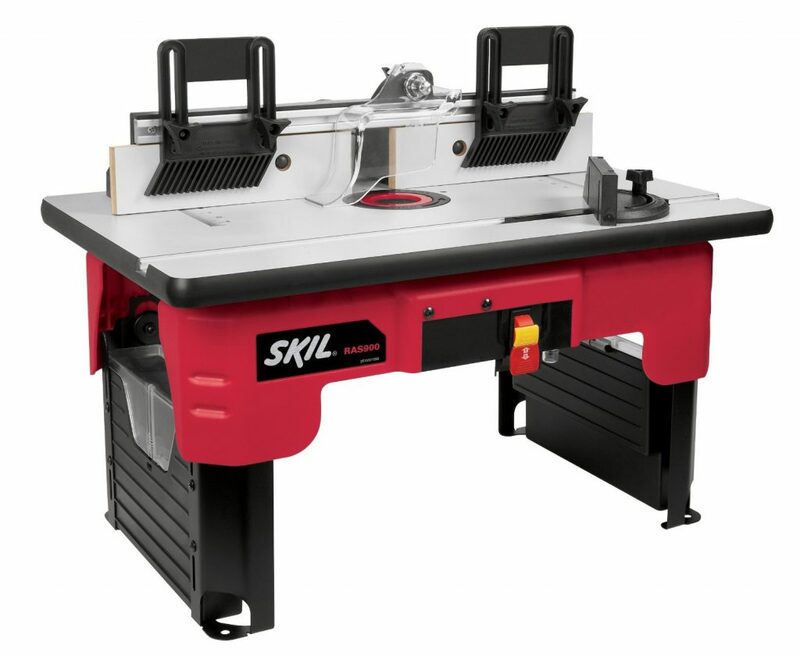 Whether you are a part time woodworking hobbyist or an avid DIYer you are going to love the simplistic design of one of the best benchtop router table you can buy in the Skil RAS900 router table. 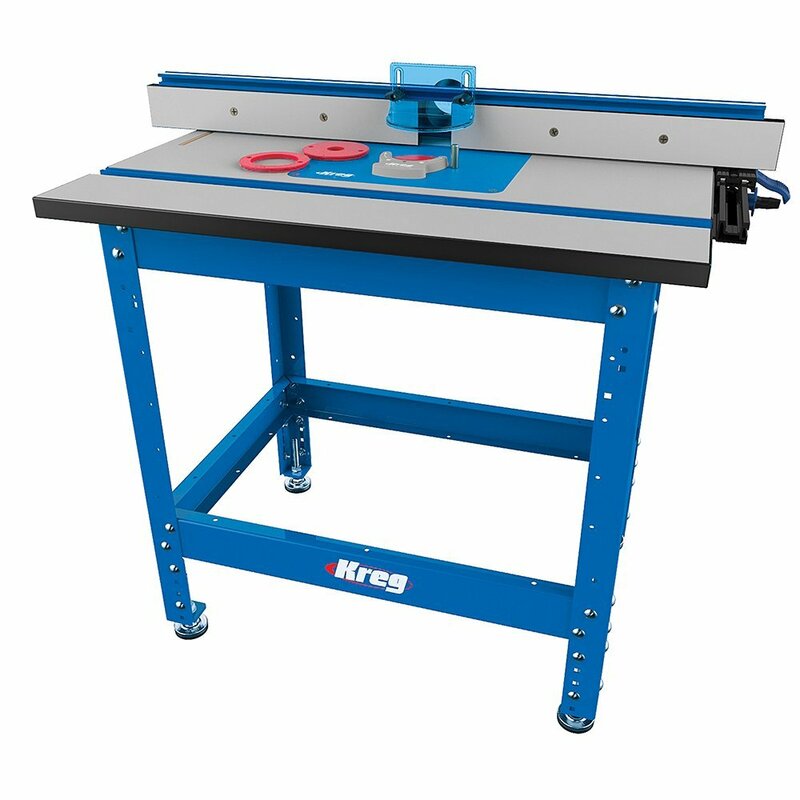 If you want all of the quality Kreg has to offer but you don’t quite need everything that the PRS1045 offers then you are going to love the PRS2100 Bench Top Router Table because of the high quality you get. You will have plenty of space for any routing project you are doing thanks to the extra-large 16 X 24-inch MDS table top design with Easy Slide surface and the industrial quality anodized aluminum fence contains adjustable faces that make it easy to use your router table from any angle you need. The full sized router plate has precision plate levelers and 3 new Level-Loc reducing rings with additional Level-Loc rings that are sold separately in sets of 5. You will get all of the sturdiness you need from the heavy-duty steel frame the table sits on and the wide-stance adjustable legs provide additional support with rubber feet vibration is reduced significantly. If you are looking for the best table router that gives you all of the features of a full-sized router table while still being portable enough to use on the job site as well as around your own personal shop, then the Kreg PRS2100 Bench Top Router Table is a great investment. We just couldn’t tell you about the best router table without including a Craftsman router table in the mix. 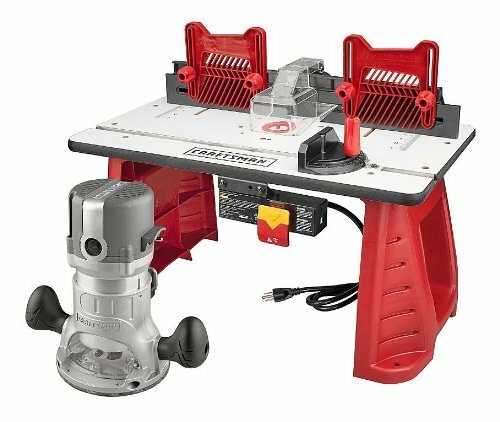 This Craftsman router and table combo is perfect for the beginner woodworker who is just starting out and looking for tools that will give you some experience with routing without breaking the bank. At the same time, this isn’t just some toy combo set that you pick up and play with whenever you want to play around in your workshop. The Craftsman router and router table combo offers some very nice features that allow you to get the job done. Let’s start with the 9.5 amp Craftsman router that has a powerful 1.75 HP motor that runs at 27,000 RPMs so you have enough power to easily route through a nice piece of hard wood like hickory. The large laminate Craftsman router table provides you with 334 square inches of space to work with and the fences are adjustable and extendable making it easy to guide your lumber across the table with ease. You also get a dual plug power outlet that makes it easy to manage your router plug, and the dust collection port will help keep all of the dust out of your workspace while making cleanup quick and easy. 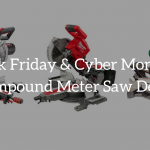 If you are someone who is just getting started with woodworking and you want to get some valuable experience with routing, or you are someone who just has a project you want to get done around your house without shelling out a lot of cash then this Craftsman router combo makes this the best router table for the money and is a great buy. Perhaps you are looking for the best router table for professional woodworkers to use? The Kreg PRS1045 is a top of the line model that provides more than any other table you have seen in these router table reviews so far. For starters, it is the ultimate in precision, design, and versatility and can easily help you tackle any project or job you are doing. 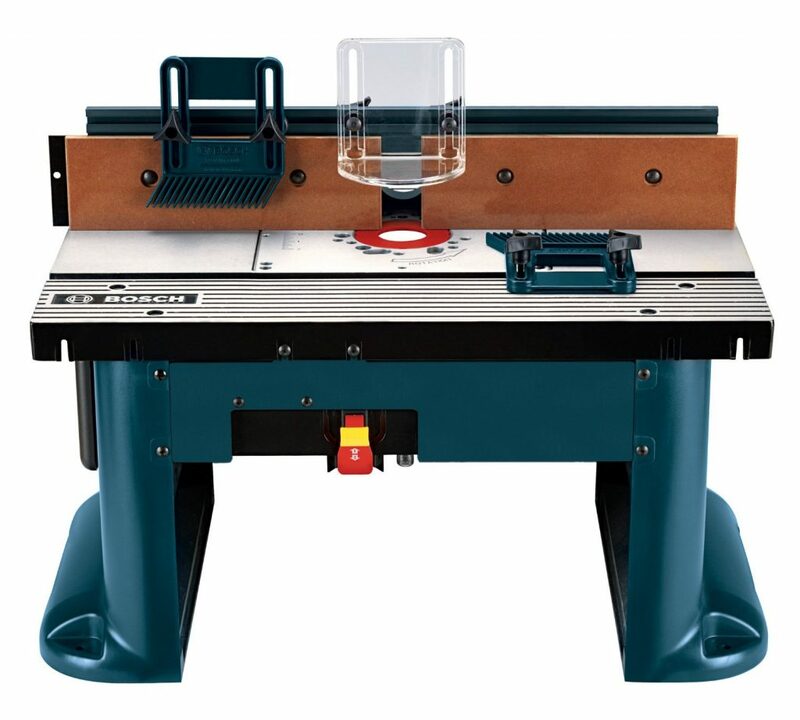 It is a multi-purpose, self-squaring router table and fence system that has a high performance table top with a precision insert-plate system that will allow you to use any router you want. The insert plate does not come with pre-drilled holes so you will have to drill your own but that is to your advantage because unlike a lot of the pre-drilled plates that only accept the most popular name brands, you will be able to use any router you choose. The large table top will give you plenty of workspace and the flat, smooth surface will ensure that your material stays level throughout your entire job. The sturdy steel frame will keep the table sturdy so you won’t have to worry about any sliding or wobbling that could easily mess up your entire project or job, and you can even customize and adjust the stand so that it is more to your liking and at a height you feel comfortable working with. 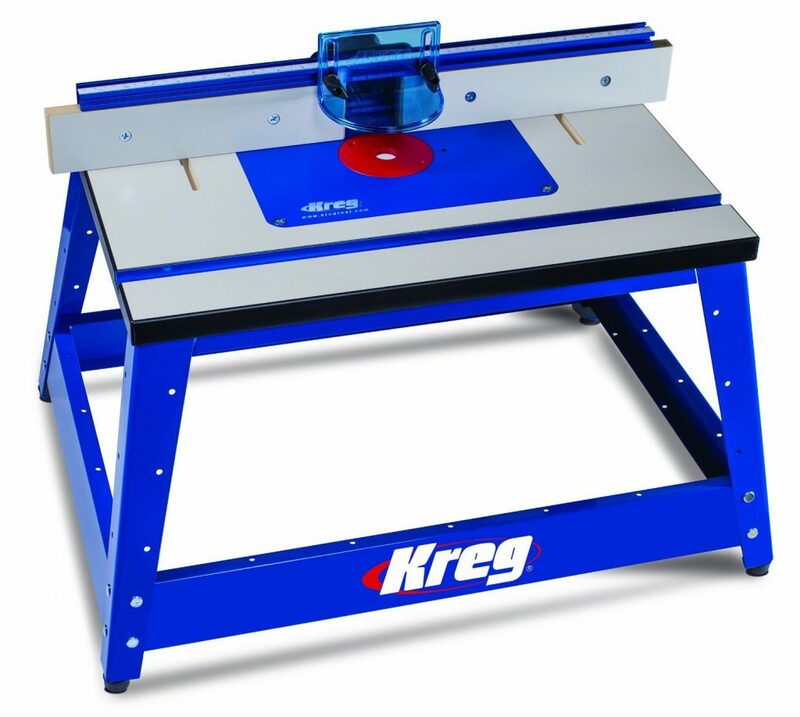 One of the most unique aspects of the Kreg Precision Router Table is the one-of-a-kind T-Square fence system that allows you to do all of the precision routing you need with ease. The Kreg PRS1045 Precision Router Table System is everything you’ve dreamed of as a professional woodworker and more, and it comes with a factory warranty that will protect you if anything should go wrong. Porter Cable has long been known for their quality tools and they have lived up to their name by creating one of the best benchtop router table you will find anywhere. To begin with, the small compact size makes it very portable so you will be able to take it anywhere you want if you are going to be using it for light jobs on-site. Its size also makes it perfect if you have a small shop and need to take advantage of every inch of space you have. You will be able to easily store and move this table around so that you can use it anytime you want. The large machined aluminum top measures 19.75 X 16.75-inches (W X L) so you will still have plenty of workspace for your projects while maintaining a flat, smooth table top. The quick-adjust split-fence design allows you to independently adjust each half of the fence so that you can better line it up with your material to work from the front, back, or laterally very easily. You will also get two router plates to use so it will accept any type of router you are using and the adjustable legs of the stand allow you to accommodate routers of all sizes. There are also features such as the ¾-inch miter gauge slot and multiple starter pin locations useful. If you are looking for a mix of mobility, portability, and quality then you simply can’t go wrong with the Porter Cable 698 Bench Top Router Table that is backed by a manufacturer warranty. Finding the best router table can be a little bit difficult depending on the type of jobs you are going to be using it for, but the 8 tables we just reviewed for you are the absolute best for a variety of jobs. The best router table review we did of the 8 you just saw is the Bosch RA1181 Benchtop Router Table because it is versatile enough to handle any job you are doing while giving you all of the great benefits you are looking for. Whether you are looking for the best benchtop router table or you are looking for the best router tables for woodworking professionals you simply can’t go wrong with any of the 8 you just saw.